Everyone knows the “for dummies” series, they are intended to teach the basics to people new to the subject. This book is well written, easy to follow and contains everything you need to know as a beginning ukulele player. After learning all the basics for your ukulele play, you can start playing some interesting songs. This book contains simple instructions to play these 21 songs on the ukulele & is perfect for beginners. 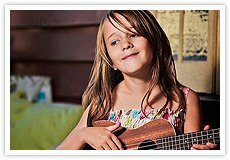 After the books for beginners, now intermediate players can learn to play lovely finger style solo arrangements of classic Hawaiian songs, folk songs, standards–even a few pieces from the classical guitar repertoire. The book offers 27 arrangements from around the world written in standard notation and tablature playable on any ukulele.